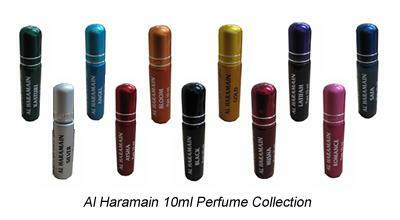 All 11 Al Haramain 10ml fragrances for a discounted price. A new pure perfume range introduced by Al Haramain in a newly designed 10ml bottle. Quality, long-lasting, alcohol-free perfume oil. This is a simply wonderful set. I love every fragrance. I get many compliments at work on each different scent. I know I will be coming back for more when these run out. I also love the convenience of the roll-on. Thanks for some great fragrances.